I loved this story! It’s a perfect summer read, since so many kids are facing their own swimming pool challenges at this time of year. When I read this book to my kindergarten students in June, they really enjoyed it! 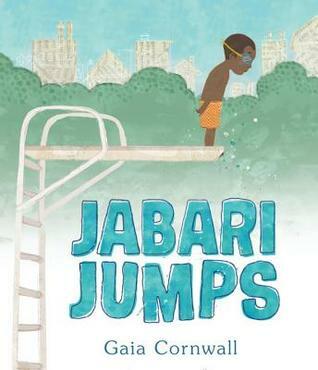 Jabari Jumps was written and illustrated by Gaia Cornwall. It was published in 2017 by Candlewick Press. “I’m jumping off the diving board today,” Jabari told his dad. This story has the kind of simple but perfect concept that many picture book writers are looking for. Most kids can relate to some kind of swimming challenge, whether putting their head under or jumping in, or, like Jabari, trying the diving board. I really loved how the author portrayed the relationship between Jabari and his dad. The support of Jabari’s family is with him, even when he’s making his own decisions. I also loved the size of this book, the diversity of the characters and the subtle but playful use of different textures in the illustrations. There's a lot of scope for lessons related to this book! I might have students make predictions about what will happen in the story, and talk about emotions and feelings based on Jabari’s actions and expressions. It would also be a great way to start a discussion about discussions about fears and strategies for coping with them, beginning with Jabari’s strategies of taking a deep breath or taking his time to think and be ready. Although this is probably not the intent, adults can learn a lot from this book too, in the way that Jabari’s dad calmly lets Jabari make his own decision about whether to jump or not. What challenges have you faced when learning something new? What did you do when you felt scared? Think about something you are scared to try. Draw a picture to show how you might do it or write a list of steps to get past your fears. Just bought and read this book... absolutely loved it. So many conversation starters and connection to self for my students to be engage with. Also there are a lot of standard connections too! It's relatable for all ages and the pictures are absolutely beautiful. Can not wait to read it to the students. It's wonderful, isn't it? A really great addition to a classroom or school library.